Aaron Copland Collection, Music Division, Library of Congress. Classical, or concert music composers writing film music is not new by any means. We have seen composers like Philip Glass and Eric Whitacre recently. Many of the composers listed have done many different genres, so it is no surprise that they worked on films. As a director or producer, it must have been great to have a prestigious "serious" composer to score the film. So here is a list of a few of those "serious" composer and their foray into composing for films. One of the first well documented scores was the film short from 1908 L'assassinat du duc de Guise, with music by Camille Saint-Saëns. William Walton (1902-1983) composed for both concert and film throughout his life. His most well received film scores are the ones for Laurence Olivier’s Shakespeare adaptations Henry V (1944) and Hamlet (1948), both of which received Oscar nominations. Benjamin Britten (1913-1976) composed few works for film, many being short films or documentaries. Ralph Vaughan Williams (1872-1958) wrote several for several films in the 1940s. One major composer to straddle both worlds was Erich Wolfgang Korngold (1897-1957). He actually wrote more concert music, but his film music is what he is most remembered for now. Most of his concert pieces have been recorded and are performed across the world. Two popular American composers also wrote for films. 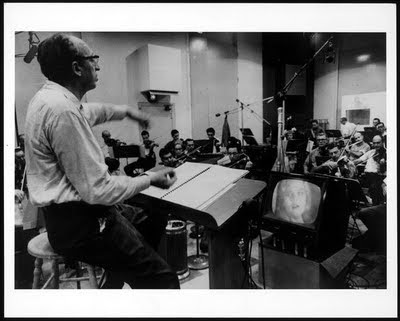 Aaron Copland (1900-1990) wrote nine scores including Our Town (1940), Of Mice and Men (1939) and The Red Pony (1948) and Leonard Bernstein (1918-1990) only did one original film score - the haunting score for On the Waterfront (1954). Bernstein was Oscar nominated for Waterfront, and Copland was nominated six times, winning in 1949 for The Heiress. One composer who has blended music from both worlds is John Corigliano (1938-). The only films he scored are Altered States (1980), Revolution (1985), and The Red Violin (1999). His score for Altered States was Oscar nominated and was brought to a global audience as he won for The Red Violin. He has since reworked his thematic elements from the score and turned it into a suite and his Concerto for Violin and Orchestra “The Red Violin” to be performed on the concert stage. Talk about full circle. Philip Glass (1937- ) is another composer who has transitioned smoothly, as his style of music fits nicely as underscoring. His work on documentary films is most impressive, including the Godfrey Reggio trilogy (Koyaanisqatsi, Powaqqatsi, and Naqoyqatsi). His other notable scores include Candyman (1992), Martin Scorsese’s biopic Kundun (1997), additional music for The Truman Show (1998), The Hours (2002), The Illusionist (2006) and Notes on a Scandal (2006). Tan Dun (1957- ) is another name that appears in both categories. Mostly known for his scores to Crouching Tiger, Hidden Dragon (2000) and Hero (2002), he has composed several operas and concert works. He is known for using his Chinese techniques and instruments and applying them into his works. The two major composers that come to mind are Sergei Prokofiev (1891-1953) and Dimitri Shostakovich (1906-1975). Both are known for their extensive concert repertoire and are common in just about every major symphony orchestra. Most regular concertgoers aren’t aware of their scores for film. Shostakovich’s film work began in 1929 and continued until 1970. Many of the scores were written for director Grigori Kozintsev, including 1930’s Alone, 1964’s Hamlet and 1970’s King Lear. While many conservative audiences find his main musical output to be too complex, his film music is more accessible without removing the composer from the work. Having played piano accompaniment for silent films, Shostakovich was easily able to transition to score composing. Many of Shostakovich’s film suites and soundtracks have been released and slowly making their way into his standard repertoire. Prokofiev on the other hand is known for his suites arranged from his few film scores. One of his more popular orchestral suites is Lieutenant Kije, based on the film of the same name. His other popular film score is for Sergei Eisenstein’s Alexander Nevsky (1938). This score in particular has been an inspiration to many future film scores and composers. This brilliant score was turned into a cantata by the composer and has been recently re-released. Prokofiev’s other film masterpiece is the multi-part epic Ivan the Terrible (1944, 1958). These composers (and several others like Richard Strauss, Richard Wagner, and Igor Stravinsky) have shaped the film music we listen to today. Without many of these composers, we wouldn’t have the sound achieved by Jerry Goldsmith, Hans Zimmer, James Horner, Patrick Doyle and John Williams.